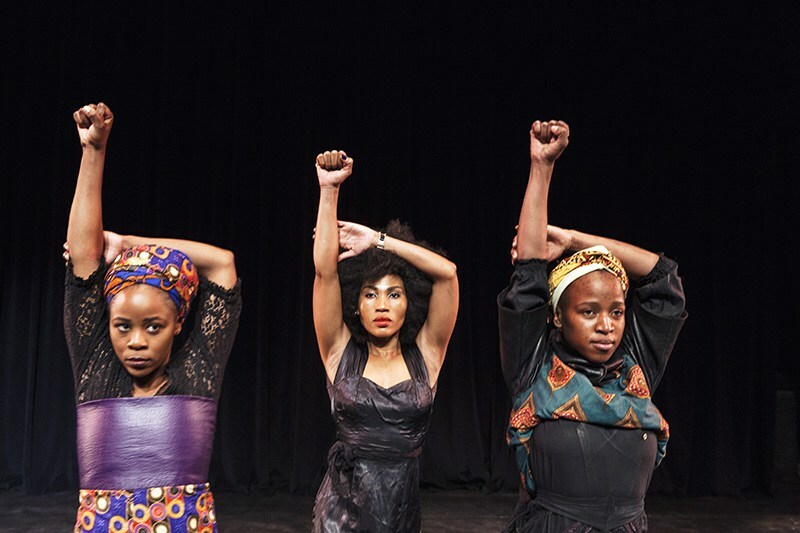 Nomasonto Radebe, Lesoko V Seabe, and Nommangaliso Tebeka performed in the first staging of In Her Shoes. Julia Zenzie Burnham replaced Lesoko in last week’s performance during the Arts Incubator’s Trade Fair. The haunting strains of Bra Hugh Masekela’s Stimela playing through the sound system as we gathered to watch In Her Shoes at the Market Theatre seemed a strange choice for a dance performance inspired by the horrific murder of Karabo Mokoena at the hands of her lover Sandile Mantsoe. But the choice was, on reflection, inspired. Bra Hugh’s composition is about the inhumane practice of migrant labour which, given the legislative context of Bantustans and the myriad laws that prevented free movement and work for black people, was one notch above slave labour. Stimela is, essentially, about men. Black men, and the hardships they had to endure to provide for their families. It’s about the train that takes them from their homes and the arms of their women and the laughter of their children and deposits them at the mines where they sweat and die in the deep dark belly of the earth. Musically, the composition also hinges on silence, the long spaces between notes which serve to intensify the broken beat that seems always about to fall over itself. Although the performance we were about to watch was about the experience of women, Bra Hugh’s lyrics provide insight into the crisis of violence against women. Without in any way excusing the murderous actions of Sandile Mantsoe and the hundreds of men who murder their intimate partners in South Africa every year – and the thousands who inflict verbal and physical abuse – the centuries of colonial and then apartheid brutality which destroyed families and traumatised the nation’s psyche for generations are not cleansed with one democratic election. The legacy we live with is the violence that is our daily reality. The seemingly irrational violence of brutalised men which has been handed down from generation to generation, and the silence of women who have been expected to bear their burden, endure the punches, and who themselves bought into the idea that they had to remain strong in the face of continual onslaught by oppressive forces – including the patriarchy. This, in a sense, is the silence between the searing notes of Bra Hugh’s masterpiece. But as In Her Shoes reveals, women are dissembling this trope. The men may still be caught in the biblical enactment of old testament violence, with the iniquities of the father visited upon the sons to the third or fourth generation, but the daughters have had enough. Women are tired of being a rock, it is time vulnerability is allowed. No more not saying anything about being sworn at. Which leads to not saying anything about being slapped. Which leads to not saying anything about being punched and kicked. Which leads to being strangled, or knifed, or shot. And then it is too late to say anything. It seemed this was what In Her Shoes conveys us as Nommangaliso Tebeka performs an opening solo in which she shifts between the gestures of being silenced (or silencing herself) as her hands fly up to cover her mouth, alternating with gestures of anguish, coquettishness, and surrender to a soundtrack that emphasises the lyric ‘I’m a go-getter’. She shifts to striking self confident poses only to continually stumble and fall, unable to keep up appearances. It is this desire to show the world that you’re okay that plays into the hands of the abuser, keeps things behind closed doors. “Stop looking at me like that, I’m fine,” she says. This facade begins to fall completely apart, Tebeka’s precise movements becoming more frenetic, more angular. “Mercy. Mercy,” we hear. The performance transitions as we hear snippets of the news bulletins about Karabo Mokoena’s funeral. What we don’t hear is the silence surrounding the hundreds of other women who are killed by their intimate partners every year in South Africa. Four performers re-enter, bound by ropes, one kneeling on the shoulders of the other three. The costume has changed to a punk amalgam of traditional attire. Beads, feathers, leather, skirts. And in the air a keening, as if we are entering the place of the dead. And in the back corner where microphone stands and assorted musical equipment lurked, as if abandoned, musicians now sit, with guitarist Princess Tshabangu providing a narrative comprising reminisces of innocent memories, turning to more foreboding scenes. Nompumelelo Mhlapo leaves centre stage and joins the musicians to form a quartet as the trio of Nommangaliso, Nomasonte Radebe and Julia Zenzie Burnham dance a dance of choices; the choice between submitting to the position patriarchy determines for a young woman, or following the desire for independence and self-determination. Although the dance, and the dancers, are riveting as they enact a choreography of destiny, so precisely in time with the musicians it seems their own limbs pluck the strings and stroke the keyboard, the narrative is ultimately reductionist. It’s this or it’s that, a simplification of all the possibilities and complexity we carry within ourselves. Yet the charisma of their caricatures carries us through this narrative drought so that we are with them when they arrive together at the point of protest at their need to protect themselves from those who want to love them. Some narrative reductionism is also forgivable in a work that, given its subject matter, avoids succumbing to the form of diatribe, which is an unfortunately common theatrical trap. In Her Shoes presents a powerful indictment against patriarchy and its ultimate violent manifestation but it does not harangue us. Through the interplay of movement, music and well-placed text – both live and recorded – it takes us on a journey, inveigling its way through our defences as it reveals the terrifying landscape of being a woman in this fucked up country. It is, in its way, the feminine version of Stimela, taking us on the train of internal dislocation where the return of the man to the home, that place that is supposed to be safe, is what is feared. In Her Shoes, which was created as part of The Market Theatre’s incubator programme, was performed at the second annual Art Incubator’s Trade Fair held at the Market Theatre precinct last week. Musicians: Siyabonga Sindelo (keyboard), Xolisile Bongwana (vocals, percusion), Nompumelelo Mhlapo (vocals, percussion), Princess Tshabangu (vocals, guitar).